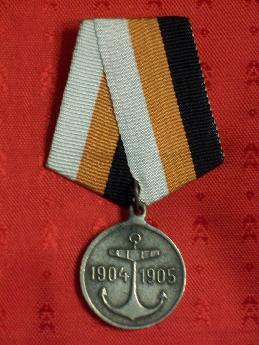 You are looking at an extremely rare Medal of Far East Expedition of the Naval Squadron Under Admiral Rozhestvensky. This silver medal was instituted in 1907 and awarded only to commissioned officers, petty officers and sailors of the Second Pacific Naval Squadron who took part in the Far East Expedition in 1904-1905 under Admiral Rozhestvensky. This Medal is unusual in that it is one of the few ever issued by any nation for a defeat. However, it must be remembered that the officers and men who took part in this almost suicidal mission were entitled to recognition. The obverse of the silver medal bears in its centre of field a large anchor flanked by the dates: "1904 1905". 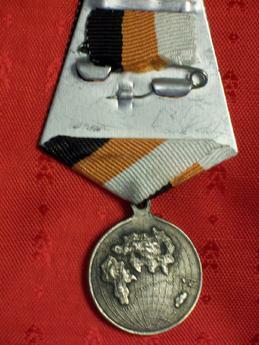 The reverse of the Medal shows the map of the Eastern Hemisphere in relief indicating the route sailed by the Baltic Fleet.